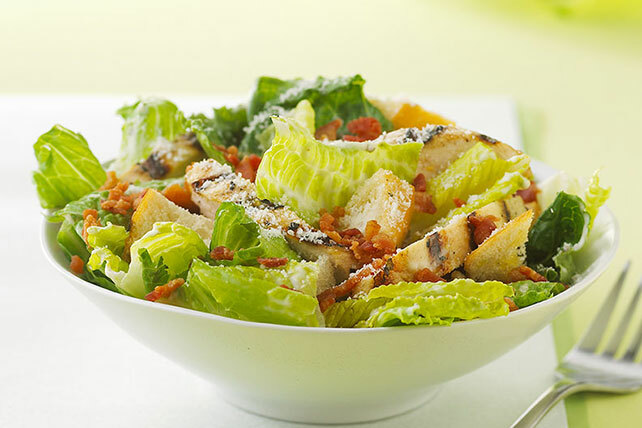 Create a new but soon-to-be classic salad with our Barbecued Chicken Caesar Salad recipe. Give chicken breasts a quick marinade in Caesar dressing then barbecue them for our tasty Barbecued Chicken Caesar Salad recipe. Pour 1/4 cup dressing over chicken in shallow dish; turn to coat both sides of each breast. Refrigerate 30 min. to marinate. Remove chicken from marinade; discard marinade. Heat grill to medium heat. Grill chicken 5 to 7 min. on each side or until done (165°F). Cut into thin slices. Toss lettuce with chicken and all remaining ingredients. This salad is just as delicious made with KRAFT Classic Ranch Dressing. Substitute 4 slices OSCAR MAYER Center Cut Bacon, cooked and crumbled, for the OSCAR MAYER Real Bacon Bits.